The entire bus erupted into laughter, and in an instant the invisible cord that had tied us all to our seats, silently bound by some misguided sense of propriety, had been broken. It was brilliant. Kids have such incredible social capital! How do we manage to rob ourselves of that as we grow up? And what does that have to do with this picture? Well, it captured a moment when I knew the value of that. It was snapped just hours before an earlier picture I shared of a couple celebrating their 60th wedding anniversary at the Banff Springs Hotel. I was on a business trip in the West, and before going to dinner, my colleagues and I were driving through the mountains, and stumbled upon the icy Bow Valley river where Marilyn Monroe has sprained her ankle filming her first western movie back in 1953. 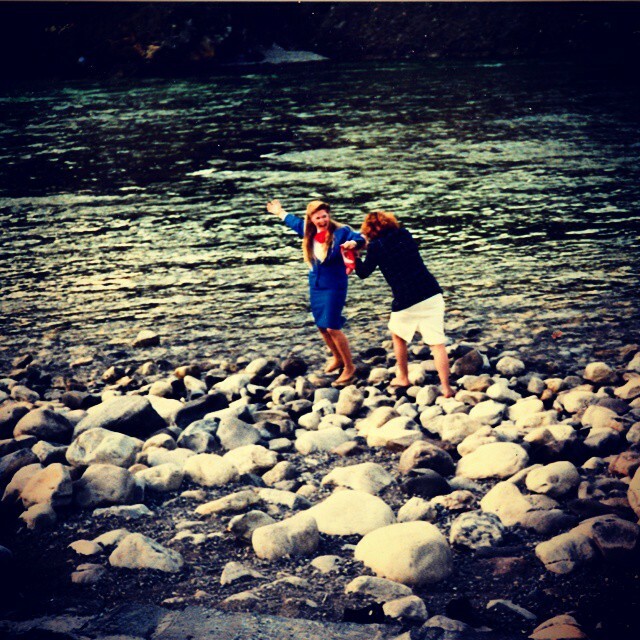 Not wanting to miss an opportunity for hijinks, I dragged one of my allies out onto the rocks in our heels. She had the sense to take hers off and leave them on the shore, but there I was, heading out to a spot just below the rapids, dragging her in. It’s one of those moments that’s stuck with me all my life, because, 30 years later, I can still remember how good it felt to say “to hell with propriety, we’re going in!” and how much we laughed our heads off the entire time. Spontaneity is highly underrated. It’s the gateway drug to mirth, and an Adventure Diva’s best friend.